In North Texas with our long, hot, humid summers, turfs and grasses are plagued with a host of pest and disease problems. Most pest and disease problems in the landscape are caused by poor cultural practices which lead to weak, susceptible, disease-prone lawns. Such self-imposed cultural practices include over-fertilization, incorrect irrigation, poor soil nutrition, incorrect mowing heights, excessive thatch, and poor drainage. Other contributing factors to lawn problems may include excessive humidity/rain, soil compaction, and highly alkaline soil. Proper diagnosis and treatment by a professional, licensed applicator will ensure your turf gets the attention it needs. 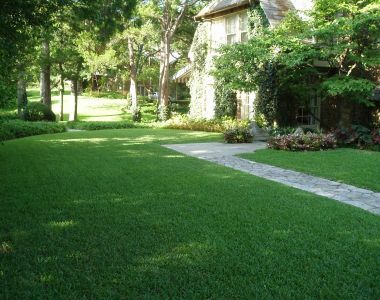 The most common turf pests in the Dallas and Fort Worth metroplex include Bermuda Mites, Chinch Bugs, and White Grubs. Microscopic Bermuda mites turn grass brown and cause short, stubby, bristled runners on grass shoots. Chinch Bugs feed on grass nodes and create wilted, yellowish, brown patches within the turf. White Grubs, the larval form of June Bugs, will chew off the roots of grasses and turfs bringing about yellow spots in lawns. Grass and turf diseases common in Dallas, Collin, Denton, and Tarrant counties include Gray Leaf Spot, Brown Patch, Bermuda grass or St. Augustine Decline, and Slime Molds. With Gray Leaf Spot fungus, grass will yellow then brown, with blade edges turning purple and twisting. Both Brown Patch fungus and Bermuda & St. Augustine Decline fungus cause round patches of brown and thinning grass. Slime Mold is an unattractive, grayish, slimy, milky-white yet harmless mold found on grasses and mulches during warm, humid weather. Because of the varying biology of insects, fungi, and diseases, it is always best to consult a licensed trained professional where chemical treatments are involved. If done incorrectly, the situation could worsen and hard-earned money and time is wasted. A state-licensed pesticide and herbicide applicator will know the correct chemical or organic treatment for any lawn and landscape problems, whereas a trained landscape contractor will understand the proper cultural controls for pest and disease problems in lawns and turf. Ensure the contractor is a licensed Pesticide/Herbicide Applicator. Inquire if chemicals are safe for use around children and pets. Convey to your contractor if you have a preference for organic treatments, as opposed to chemical applications. Request a time-line for treatment effectiveness. How long before you will see results? What cultural changes, such as adjusting mower height, decreasing irrigation, improving the soil structure, can you make to prevent future pest and disease problems?